Above: Visible satellite image of Tropical Storm Lane at 6:15 pm EDT (12:15 pm HST) Saturday, August 25, 2018. Image credit: NASA/MSFC Earth Science Branch. 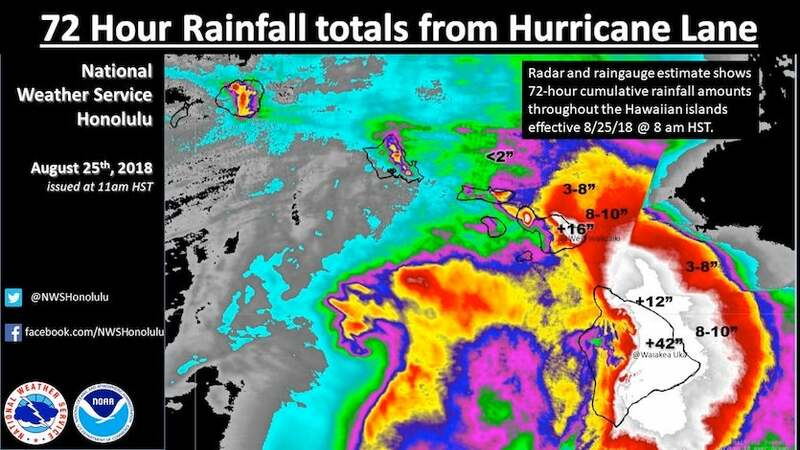 Rainfall amounts were titanic, but damage appears to be limited, after Tropical Storm Lane pulled rainband after rainband across Hawaii from a perch well southwest of the islands. Peak rainfall totals on the eastern Big Island topped 40” at three stations, adding up to amounts that are among the highest ever observed in a tropical cyclone in the 50 U.S. states. Fortunately, wind shear disrupted Lane’s core circulation before the hurricane had a chance to plow directly into any of the islands, and Lane stalled out just far enough to the southwest to keep its central showers and thunderstorms (convection) mostly offshore. Despite the stark contrast between model forecasts for Lane’s path, including several that called for a landfall near Maui, the NOAA/NWS Central Pacific Hurricane Center did a very impressive job with a high-pressure forecast, forging a consensus outlook that proved more accurate than any single model’s take. As of 5 pm EDT (11 am HST) Saturday, Lane was located about 145 miles southwest of Honolulu and about 160 miles south of Lihue, drifting west at 7 mph. Lane’s top sustained winds were down to 50 mph, and Lane will almost certainly be downgraded to a tropical depression by Sunday, if not sooner, as it continues westward away from the islands. All tropical storm watches and warnings have been discontinued. Lane may regain a bit of strength later next week as it morphs into an extratropical low and sweeps toward the long string of tiny, uninhabited Northwestern Hawaiian Islands. 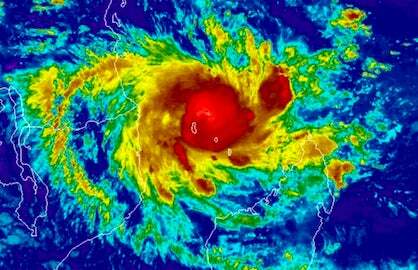 Infrared satellite imagery showed Lane’s central convection expanding and contracting on Saturday within the overall weakening trend. Occupants of more than 20 homes on the eastern Big Island had to be evacuated because of flooding on Friday night, as reported by the Associated Press. 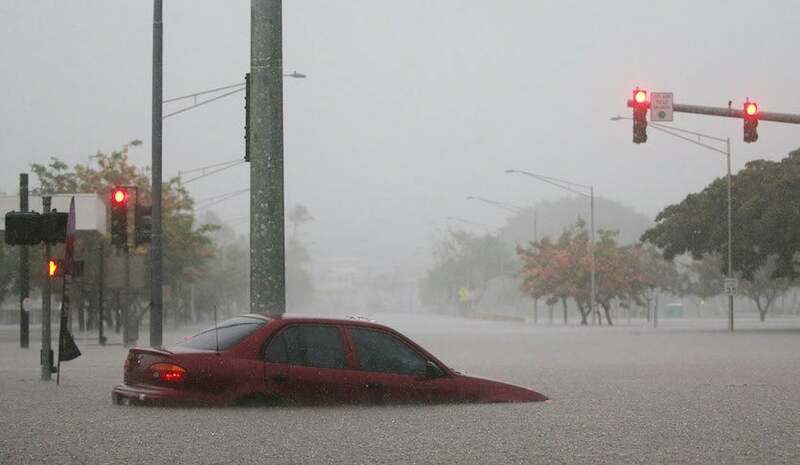 Perhaps in part because the Hilo area is so experienced with heavy rain—it’s the wettest city in the United States—no injuries were reported despite widespread flooding across the downtown waterfront and in other parts of the Hilo area. Meanwhile, on the western cost of Maui, seven homes were destroyed and one woman was injured by a brush fire early Friday. Downslope winds on the dry side of Maui’s higher terrain may have exacerbated this blaze, along with two others that broke out on Friday morning along the same stretch of coastline. For more on Lane’s impacts, see the frequently updated weather.com article. Figure 1. A car is stuck partially submerged in floodwaters from Hurricane Lane’s rainfall in Hilo, Hawaii, on Thursday, August 23, 2018. Image credit: Mario Tama/Getty Images. The following rainfall totals were recorded by automated gauges from noon HST Wednesday, Aug. 22, through 4 AM HST Saturday, Aug. 25. All rainfall totals below for Lane are preliminary, pending final quality control. HI-HI-34 HONOKAA 2.7 ESE: 29.28"
HI-HI-50 PAAUILO 2.4 SW: 25.01"
HI-HI-11 PAPAIKOU 1.1 N: 19.70"
Even though it was still raining over parts of Hawaii on Saturday, we already know that Lane will go down in weather annals on at least two counts. * There have been eight instances of even-higher monthly totals in Hilo during the months from November to April, when persistent winter-type patterns can occur. In National Weather Service NOWData records going back to 1949, Hilo’s highest total for any month is 50.82” in December 1954. Lane’s three-day total of 31.85” at Hilo—the city’s highest total for any three-day period in NWS NOWData records going back to 1949—falls short of the 40.53” dumped by Harvey between August 28 and 30, 2017, at Beaumont–Port Arthur, Texas. Figure 2. Rainfall totals calculated from rain gauge and radar data across the Hawaiian islands for the 72-hour period ending at 5 pm EDT (11 am HST) Saturday, August 25, 2018. 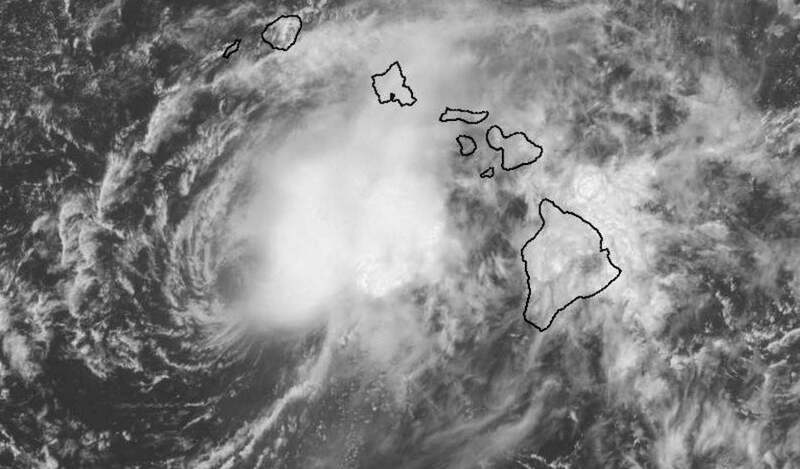 Image credit: NWS/Honolulu. 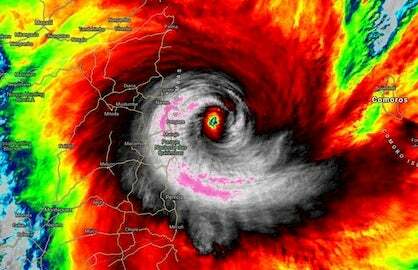 You wouldn’t know we were approaching the peak of the Atlantic hurricane season by looking at a satellite image. 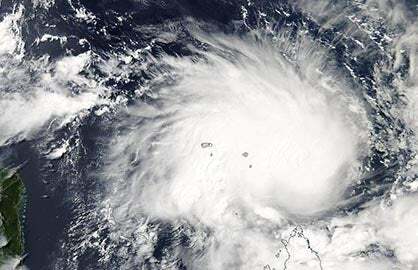 The Atlantic tropics remain unusually tranquil, and the Tropical Weather Outlook issued Saturday afternoon by the NOAA/NWS National Hurricane Center predicts that no tropical cyclones will form through at least Wednesday. Long-range European and GFS model ensembles suggest a better-than-even chance of development over the deep Atlantic tropics about 10 – 14 days from now, which gives us plenty of time to monitor the situation. Sea surface temperatures remain 0.5°C to 1.0°C (1–2°F) below average for this time of year across the heart of the Main Development Region between Africa and the Lesser Antilles. Though cool for the season, these SSTs are generally warm enough to support development if any disturbances wind up in areas where this season’s stronger-than-average wind shear happens to slacken. Two disturbances in the East Pacific bear watching, both of which could develop into tropical depressions or tropical storms next week as they head west-northwest away from the Mexican coast. The Northwest Pacific has quieted down, with no named systems currently being tracked and none expected in the next several days. One year ago Saturday night, Hurricane Harvey began its catastrophic course across Texas by making landfall near Rockport, where some 20% of the structures were destroyed or severely damaged. Harvey went on to dump mind-boggling amounts of rain in southeast Texas, ending up as one of the most destructive tropical cyclones in U.S. history. 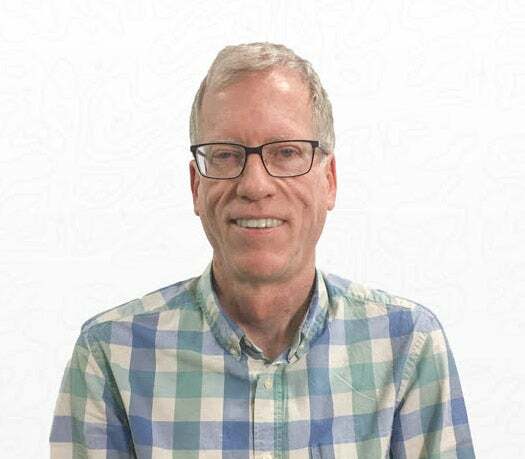 In the weather.com article “We’ve Never Forecast This Much Before,” Jon Erdman takes an evocative look back through tweets and other statements to see how meteorologists handled the increasingly dire rainfall outlook for Harvey in the days before and during landfall.